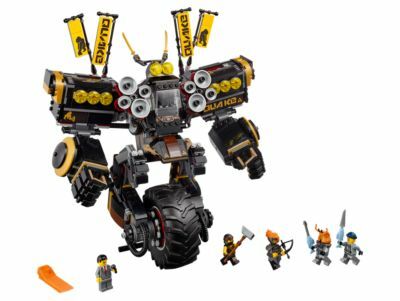 Fire ‘soundwaves’ from Cole’s Quake Mech to save TV reporter Fred Finley from the shark army, with this all-action THE LEGO® NINJAGO® MOVIE™ set. The highly posable, uni-wheel Quake Mech features an opening minifigure cockpit, fold-up shoulder ‘loudspeakers' with 8 hidden ‘soundwave'-shooting flick missiles, fully posable arms with gripping fists and a big wheel with stabilizer. This cool toy for kids also includes 5 minifigures with assorted weapons to intensify the role-play battles. Price is 34% below the initial Lego retail price, a € 31.00 discount! This comes down to 4.91 cent per brick. The Quake Mech (70632) Lego set is available from the sites below. However, they do not offer delivery to your selected region. The Quake Mech (70632) Lego set is no longer directly available from the sites below. However, 3rd party partners of these sites might still have the set available. Alternate description Turn sound into a weapon with Cole’s Quake Mech!